A few years ago I learned how to make some delicious Middle Eastern dishes. One of my favorite dishes is tabbouleh. Tabbouleh is a traditional Arabic salad that most often consists of tiny chopped pieces of parsley, mint, onion, garlic, tomato, TONS of lemon juice, and bulgur. Bulgur is a tiny dried whole grain that has a light nutty flavor. My tabbouleh slightly various from the traditional because I like to add garbanzo beans to it. Garbanzo beans are a fantastic source of protein, zinc, fiber, and folate. I love making this salad because not only is it delicious it’s also filled with nutrients and tons of fiber! I enjoy it on its own, stuff it in sandwiches, use it as a second dip after dipping bread in hummus, and can even put it in a meatball recipe to give it great flavor and a slight crunch. I usually make a large batch and relive the heavenly flavor each day for about a week. Put bulgar wheat in a large bowl and add 2 cups of warm water. Allow to soak for 30 minutes. Once bulgar is ready, drain out all the water as beast as you can. Squeeze excess water from the bulgar using paper towels if needed. Place bulgar, mint, parsley, onion, and garlic in a food processor or blender. Pulse lightly while adding lemon juice and olive oil. Stop occasionally to taste. Once salad is completely combined and is finely chopped, add tomatoes and a little salt and pepper. 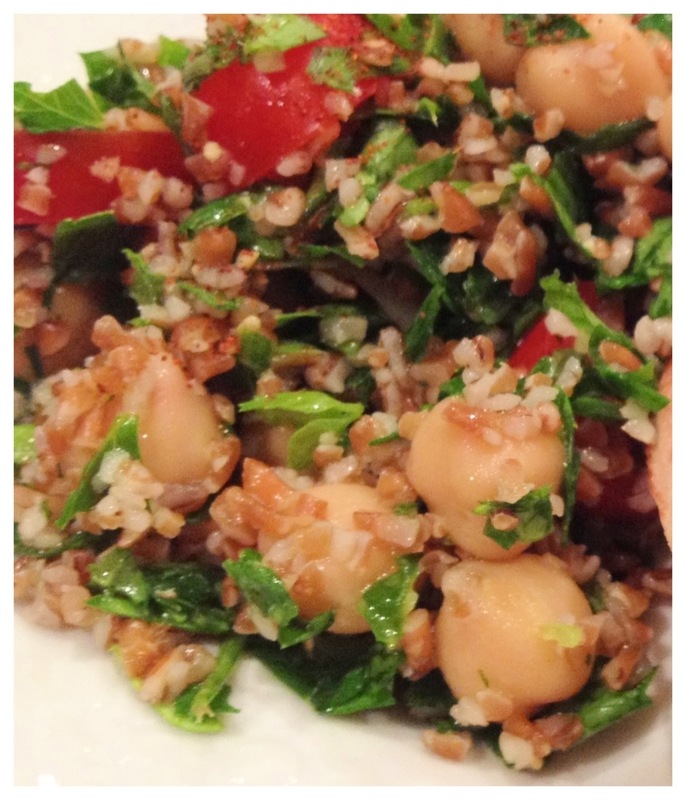 Add tabbouleh to garbanzo beans like I have for a small salad, or use it on sandwiches like I have in my Chicken Tabbouleah Pita Sandwich. Enjoy!